It was a big step for me, and I had such a lovely time! Set-up on Tuesday followed by five days (the first three from 10 in the morning to ten at night) on the balcony with wonderful friends on either side of me. The event organisers had created a great atmosphere with musicians and a terrific food emporium as well as a huge Christmas tree and great pennants hanging down. I was delighted to be in stand B8 - the Aura-Soma bottle B8 is all about lightening the heart by following your joy and doing what you love. 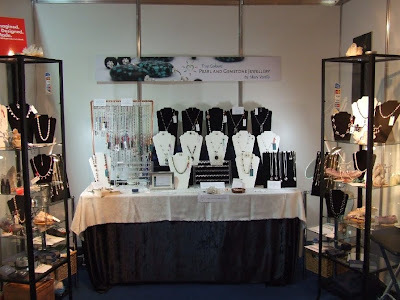 I loved connecting with those who came in to my stand, and quite a few remarked on seeing my motto - made with love, wear with joy - that they could feel the love in the jewellery. The Aura-Soma Air Conditioners came into their own for clearing and lifting the energy on our stands. 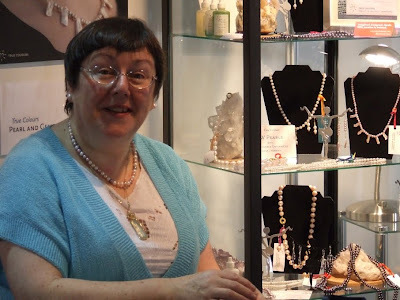 There was such a great sense of positive energy surrounding us and people seemed to relax and open their purse strings to treat themselves to something nice as well as buying beautiful gifts for friends. The long-drawn-out two-month process of applying for a credit card machine culminated in delivery of the machine in the nick of time, the evening before the show opened! And a number of people commissioned me to make something for them in the weeks following the show, so tons of encouragement!